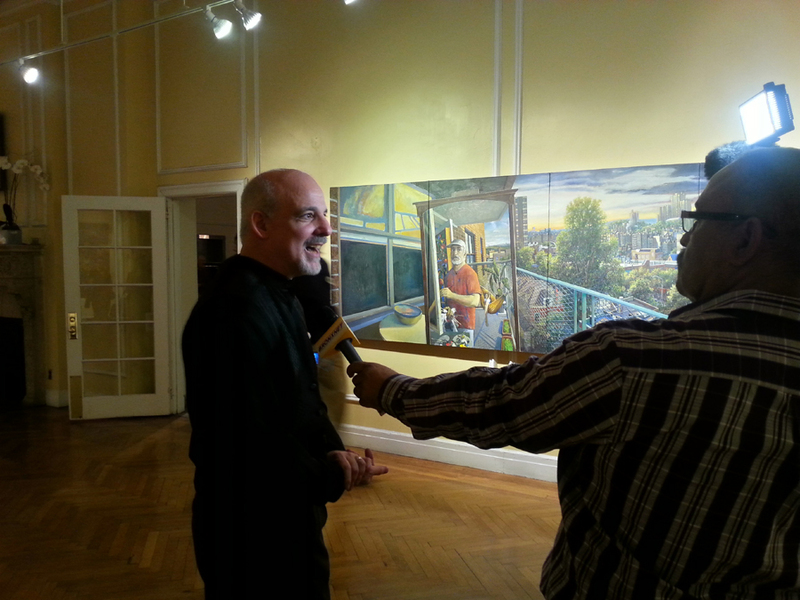 Several weeks ago I had the pleasure of receiving an invitation to Daniel Hauben’s opening reception at the Andrew Freedman home for his latest exhibition: Expanding Views: The Art of Daniel Hauben. The exhibition is quite breathtaking as I’ve never had the pleasure of seeing his works up close. The paintings capture the essence of the Bronx so clearly that it is no wonder why Bronx Community College commissioned 22 paintings by Hauben for their new North Hall and Library. 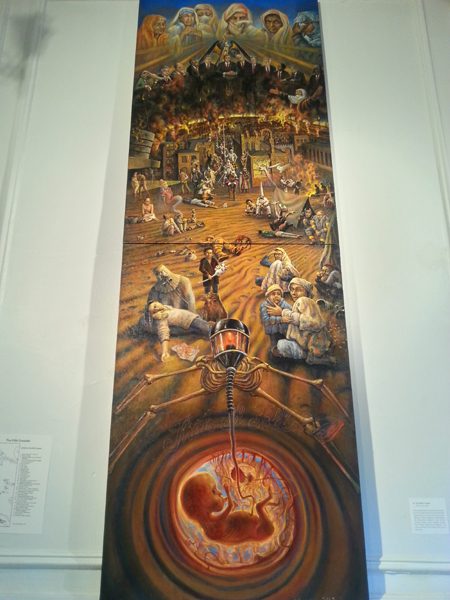 Daniel Hauben has recreated scenes from the wild cacophonous landscape and its people that is our beautiful borough for several decades now, including the “burning” days. The exhibition, although mostly Bronx-centric, does contain several other powerful pieces such as one based on 9/11 and also a towering masterpiece titled ‘The Fifth Crusade’ which was, “…Hauben’s passionate response to the US invasion of Iraq and the looting of the Baghdad museum…”. Where in the Bronx did you grow up and which schools did you attend? Until age nine I lived at 3458 Fenton Avenue in Hillside Homes (now Eastchester Heights), I attended PS 78. When we moved, it was towards the end of 3rd grade, and I finished the year at PS 95. We moved to Fort Independence Street in the Kingsbridge section of The Bronx and I suffered through 7th, 8th, and 9th grade at JHS 143. What is it about the Bronx that calls to you as an artist to use it as the subject of your artwork? It is the extreme density of the Bronx, its throbbing activity, multitude of cultures and the resultant visual explosion, that I find so captivating and challenging as a subject for my paintings. No conscious plan could have created this extraordinary layering of architectural styles, this visual arrangement of forms which is constantly being torn down and rebuilt again. The Bronx is changing before our eyes, yet vestiges of all its incarnations remain. Today I walked down a Bronx street and saw a row of track houses (hastily erected in the 1980s), next to a vacant lot with a solitary burnt-out building at its center. An old Jewish man wearing a black overcoat and top hat strolled by a Puerto Rican mango vendor and disappeared into a 99cent Store. These incongruities, these unpredictable juxtapositions – sometimes astonishing, sometimes amusing, and sometimes depressing, but always captivating and provocative – are the fuel for my art. If you could choose one of your pieces, which is your favorite, and why? Happily, my favorite painting is almost always my most recent one. This is because I am constantly challenging myself to build on previous experience, and take my work to places it hasn’t been before. A painting that fits this category at the moment , is a large, 6-panel painting I have been working on for a year and a half, entitled ” Urban Idyll”. I am using an unusually strong color palette to animate this sprawling urban panorama. It has been very exciting for me to share this (unfinished) painting with the public in my current exhibit: Expanding Views at the Andrew Freedman Home. What were some of the greatest obstacles you faced growing up in the Bronx? -No gallery directors would ever come up to The Bronx. “I don’t do The Bronx”. the night before the opening, at which time he suggested that I start painting Manhattan. -I have yet to be taken seriously by the Manhattan Art World. How do you feel growing up in the Bronx prepared you for the world? Growing up and making friends with children from such a diverse range of backgrounds was a wonderful thing. Until I travelled to other parts of the country where life is so much more homogeneous, I assumed that it was like this everywhere. Amongst my friends growing up were Italians, Irish, Jews, Dominicans, Puerto Ricans, Black Americans, Greeks, Japanese, Chinese, etc. When I visited friends, I was exposed to the different customs, languages, music, and especially the foods of so many cultures. This experience opened my mind to the richness of all cultures, and a life long interest in travelling, painting, and connecting to all kinds of people. Any words of wisdom that you’d like to share with budding artists out there? If you have to paint, paint! Find a way! Make your way to the Andrew Freedman Home located at 1125 Grand Concourse at 166th Street to catch this wonderful exhibit. The exhibition runs through April 24th, 2014 and is open Mondays through Fridays from Noon to 10PM and Saturdays from 11AM – 4PM. 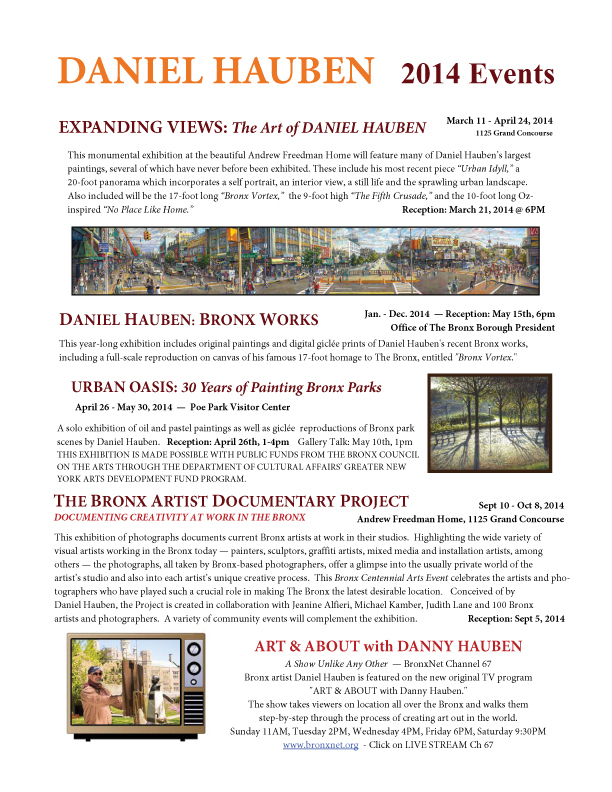 Check out the flyer below for more events where Daniel Hauben’s work will be featured!